Introduction: Esophagectomy with extended lymphadenectomy is the principal modality for the cure of esophageal cancer in case the curative resection is possible, and less invasive or minimally invasive surgery has been required to offer less morbidity and favorable prognosis. 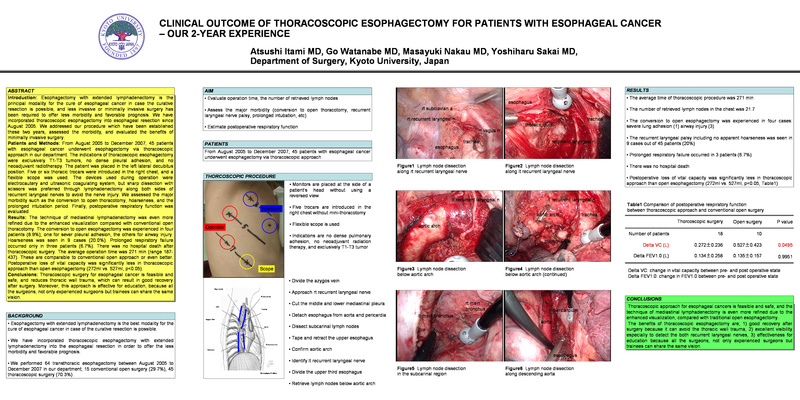 We have incorporated thoracoscopic esophagectomy into esophageal resection since August 2005. We addressed our procedure which have been established these two years, assessed the morbidity, and evaluated the benefits of minimally invasive surgery. Patients and Methods: From August 2005 to August 2007, 39 patients with esophageal cancer underwent esophagectomy via thoracoscopic approach in our department. The indications of thoracoscopic esophagectomy were exclusively T1-T3 tumors, no dense pleural adhesion, and no neoadjuvant radiotherapy. The patient was placed in the left lateral decubitus position. Five or six thoracic trocars were introduced in the right chest, and a flexible scope was used. The devices used during operation were electrocautery and ultrasonic coagulating system, but sharp dissection with scissors was preferred through lymphadenectomy along both sides of recurrent laryngeal nerves to avoid the nerve injury. We assessed the major morbidity such as the conversion to open thoracotomy, hoarseness, and the prolonged intubation period. Finally, postoperative respiratory function was evaluated.